high pressure washers. Our company is dedicated to the cleaning industry. agriculture including the Landy P.T.O. We stock a huge number of spare parts (especially washguns, lances, hoses and fittings) which fit most makes of jet washers. manufactured by Quadralene of Derby for use through high pressure washers. customers with a back-up that is second to none. 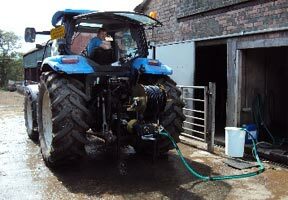 Since 2012 we have provided the cattle wash system for the Great Yorkshire Show Click Here to find out more.